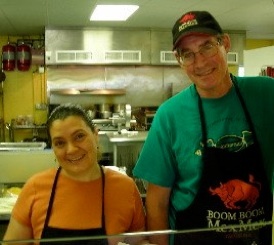 The next time I get married, I’m registering at Boom Boom Mex Mex. Forget the china, the silver, the crystal; I want tacos. And maybe another t-shirt, because they have great t-shirts; I have seven. But I’m getting ahead of myself. A long, long time ago, Tom Bryan walked away from journalism and photography to raise sheep and become penniless. Then, like Ambrose Bierce and Neal Cassady, he wandered into Mexico, where he had better luck than either of his forerunners, meeting his bride-to-be, Lupe, at Carnitas Don Toño, near the main market on Calle de Insurgentes in San Miguel Allende. She served the tacos; he felt the thunderbolt, and today, those who journey to Boom Boom Mex Mex are the beneficiaries of this chance meeting that flowered into romance and four different sauces. The Boom Boom experience is free of pretension. No one will place a napkin on your lap, unless it’s the two-year-old at the next table. And usually there are kids at Boom Boom, because they love it and you don’t go broke feeding them. On weekend evenings, Boom Boom also hosts high school girls who are not dressed to kill, but rather to lure, snare and devour. If you tire of watching people, there are photographs and art on the walls. The photos are of Lupe’s hometown of San Miguel Allende, a city in the Baijo Mountains about four hours north of Mexico City, in the state of Guanajuato. The decorative plates and other ceramics come from Lupe’s brother and sister-in-law, Gerardo Licea and Estela Aguilar of the Liceagui studio, also in Guanajuato. Even the bathrooms (which you’ll probably see because of the free refills on fountain drinks) glow with fabulous sinks from the Liceagui studio and framed prints of illustrations by Jesus de la Helguera. Helguera, a culture hero in Mexico, is also in evidence in the entryway where a huge hammered copper version of his “La Leyanda del Vulcanos” hangs. 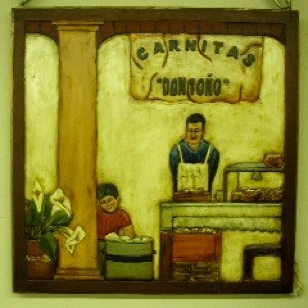 This piece was probably created in the village of Santa Clara del Cobre, in the central mountains of Mexico. Tom discovered it at the Bouckville Antique Show, buying it from a dealer who bought it from copper scavengers in Buffalo. After a long journey, it has found a good home. One caution: When you clear your table, don’t throw away your plate. I’ve done it, and it’s a long reach to the bottom of the trash bag. Tom Bryan came to Central New York in 1968 to attend Syracuse University. He was the News Editor for The Daily Orange (known in some quarters as The Daily Red during his turbulent era) and the co-founder (with Phil Block) of Syracuse University’s pioneering Community Darkrooms and Lightworks Gallery programs. He is a great cook and a wonderful story teller. Ambrose Bierce (1842-1914) was an American writer best remembered for The Devil’s Dictionary, his stories of the American Civil War (including “An Occurrence at Owl Creek Bridge”) and his ghost stories. In October 1913, Bierce toured his old Civil War battlefields, went on through Louisiana and Texas, and entered Mexico at El Paso. In Ciudad Juárez, the former Major Bierce joined Pancho Villa’s army as an observer, and accompanied Villa’s army as far as Chihuahua. In one of his last letters from Mexico, he wrote, “Good-bye – if you hear of my being stood up against a Mexican stone wall and shot to rags please know that I think that a pretty good way to depart this life. It beats old age, disease, or falling down the cellar stairs. To be a Gringo in Mexico – ah, that is euthanasia.” Bierce vanished without a trace, becoming one of the most famous disappearances in American literary history. Jesus de la Helguera (1910-1971) was born in Mexico but a revolution forced his family to flee to Spain. At the age of nine, he began to paint and study in Madrid, and eventually became an art teacher. In 1938, the Spanish Civil War forced Helguera and his wife to flee to Mexico, and there he became famous as a calendar artist. For many, calendars were an easy way to bring art into the home. Alfonso Morales Carrillo notes, “What seemed to be a simple annual advertising strategy developed into one of Mexico’s most powerful forms of cultural promotion and a graphic art tradition.” Helguera’s calendar art gave Mexicans and Mexican Americans something to be proud of: rich images of culture and history with pre-Columbian heroes, gods and goddesses based on Aztec mythology. His wife, Julia Gonzalez Llanos, a beauty from Madrid, was his inspiration and the model for his most famous paintings. The original for “Gesto Azteca,” a copy of which graces Boom Boom Mex Mex, is in the collection of the Museo Soumaya in Mexico City. Helguera’s best known painting is “The Legend of the Volcanoes.” This image has been copied by countless contemporary artists since 1940. It shows Iztaccíhuatl and Popocatépetl, a princess and warrior, the Romeo and Juliet of Mexican folklore. Legend has it that the gods were so taken with their story that they turned them into the volcanos that watch over Mexico City. San Miguel de Allende, Lupe’s hometown and the family’s winter residence, is legendary for its beauty, architecture, art, music, perfect weather, and as a magnet for expatriates.